The exhibition, titled The Guilty Pleasures of Antonín Dvořák, will present the famous Czech composer in an uncommon light – as a man of ordinary pastimes and pleasures. Dvořák was a passionate smoker, who enjoyed playing his favourite card game “darda” and loved good food (especially Czech cuisine). He frequented pubs and cafés with his friends in Prague, he would go “for a beer” to the local pub in Vysoká near Příbram, where the family stayed over summer. He played darda in the evenings with his friends and family, even when he was in America, as remembered by his American guide and companion Josef J. Kovařík. They never played for money, only occasionally for matches or buttons. As a smoker, Dvořák enjoyed pipes but also used cigars and cigarettes. Although he smoked freely in his office, he did not smoke in any of the other rooms. At the behest of his wife Anna, he likewise limited his use of the pipe to when he was at the pub (Fencls’) in Vysoká or outside in the garden. Smoking was usually associated with an evening spent in the company of his friends or family. The merry company would sometimes play cards – Dvořák would play both at home and at his usual pubs and cafés in Prague. 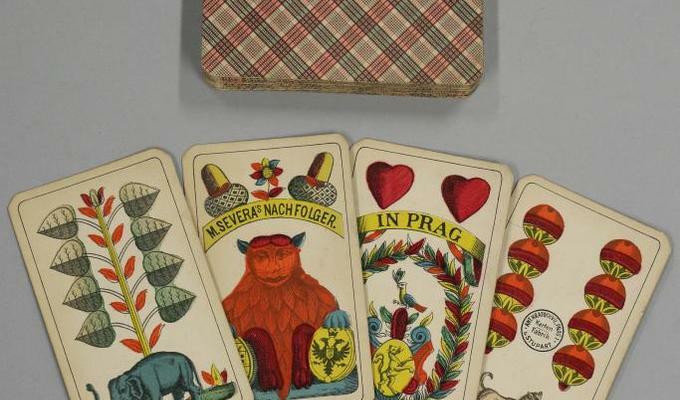 Dvořák’s favourite card game “darda” was played with a deck of 32 “mariáš” (marriage) cards with German pips, which was very popular among Czechs. Dvořák was a regular visitor at Café Paris, which was located opposite the Dvořáks’ flat in Žitná Street. He also frequented Mahulíks’, a restaurant in Myslíkova Street, where he even held the role of “protector” of a merry company of musicians that gathered there. After a performance at the Provisional theatre, where he was employed as a violist in the orchestra from 1862 to 1871, Dvořák and his colleagues would visit The Little Singers, a pub on Na Struze Street, for the superb potato soup they made there. The exhibition will display items from the composer’s personal estate, which document these pastimes – such as pipes, cigar tips and cases, cards, bowling pins, crockery from his villa in Vysoká near Příbram, or the cookery book of Terezie Liehmannová, his classmate and first love from Zlonice. Visitors can take the original recipes from the cookery book of Terezie Liehmannová – Dvořák’s first love from Zlonice or the rules of Dvořák’s favourite card game “darda”.